In January of 2004 I spent three weeks in Northern Africa. It was one of the most memorable trips of my life. The second half of my trip would be spent in Morocco with close friends, being catered to by personal attendants, drivers and handmaids, dining on the finest couscous and staying in chic riads. The first half of the trip was spent in Tunisia, a third-world country that has for years suffered through political turmoil. Most of Tunisia is uninhabited, rough and Islamic, which was simultaneously exciting, frustrating and frightening. Tunisia is an amazing country. Undiscovered beaches, the endless dunes of the Sahara, ancient ruins, bustling souks with fresh fruit and spices and the planet’s largest herd of camels. 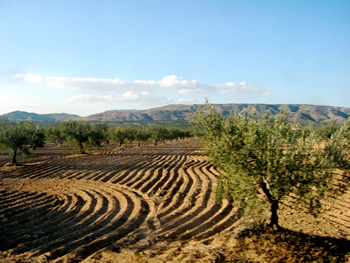 Tunisia is also the world’s largest olive grove. No ladies and gentleman, it’s not Greece. There are only a few roads in Tunisia, but all of them seem to go through olive groves. You can drive for hours with olive trees outside both driver and passenger windows. When I first arrived in country, I was met by Muslims with machine guns. Which I expected. And appreciated. In 2004 my security career was rather young, but I was no less exuberant. If they had decided to strip search the only white guy in Tunisia I would have been inconvenienced but impressed. Little did I know when I arrived that Tunisia would teach me a few things about security. On the last full day of my trip I visited Carthage, the ancient coastal ruins where Hannibal became famous. Satisfied that I had filled my quota of digital pictures, I headed for the train to begin the trip back to my hotel. I needed to pack, eat and make some calls to arrange for my trip to Morocco the following day. My mind was busy as I boarded the busy rush hour train. I passed a few stops, continuing to plot out the next day’s early morning checkout and flights. I noticed how overloaded the train was getting. I needed to remember to change some money at the airport. Just a few more stops now. I needed to send post… Is that a hand in my pocket? Time slowed to a crawl and the roar of the rush hour train came to a hush. My wallet was gone. It had some money, a credit card and a copy of my passport in it. And the doors were closing. Was that the thief escaping? I needed to make a decision and fast. So I did what any security professional would do. By the time I knew what was happening it was over. I rocked my best Walter Payton 45-Right to get off the train before the doors closed, pulling several likely innocent bystanders with me. But despite my seemingly heroic effort, the perpetrator was long gone by the time I got to the platform. I frantically challenged every pedestrian in the station that looked suspicious. They all looked suspicious. And I looked crazy. I lost situational awareness – Even though I had lived in New York City and I was a security-minded person, I was out of it on that train. It had been an exhausting week and I had less than 12 hours before I was escaping to paradise. My mind was somewhere else. While I was mentally reviewing departure times and sorting out logistics, an attacker was fingerprinting me. I was poorly defended – I was alone. It was the end of my trip and all of my laundry was dirty, so I was wearing baggy khakis with loose pockets. I was standing on a tightly packed train, hands above my head to keep from falling on some indigenous woman. I might have well been wearing a sign that said “defenseless tourist”. I became a low-hanging olive – I looked out of place. I was tired. I was in the wrong place at the wrong time. I became the low-hanging fruit and I got picked. And here’s some advice – if you ever find yourself pickpocketed in Tunisia, save yourself the time and anguish of reporting it to La Police. These are the same people who beat their own citizens with blackjacks. Your adversaries can strike at any time. The good ones will find your weaknesses and exploit them. Your business may not require the same defenses as the Pentagon, but whatever defenses you have should be up at all times. Sometimes the best lessons are those hardest learned. And now the olives in my life usually end up on a salad.